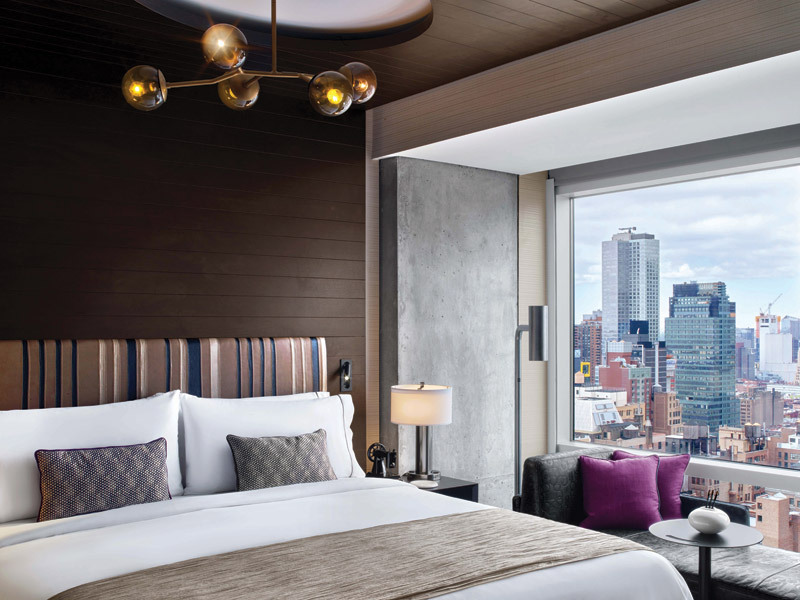 Jeffrey beers international was tasked with providing hotel chain Renaissance with a ‘fresh new design concept that embodied the objectives of surprise, delight and discovery’ as part of its rebranding package for the New York City-sited flagship hotel. 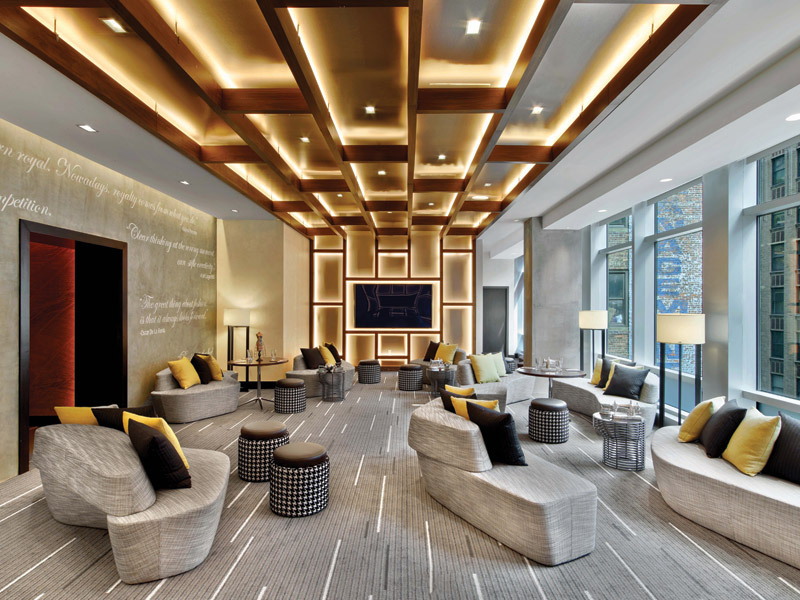 The design scheme draws inspiration from Manhattan’s energy and excitement of the artistic industries that surround the hotel, located in the Garment District. Guests, with many being solo business travellers, are encouraged to get out and explore the exciting neigbourhood thanks to a large digital experience in the lobby area. Known as Navigator, digital displays offering guests neighbourhood information, are projected along the lobby corridor, which spans the length of the block and forms a ‘living wall’, showcasing the many unique experiences the neighbourhood has to offer. The wall responds to human motion through subtle, organic movements, with graphic patterns interacting with guests as they move through the entrance hall. Visitors can explore points of interests with just the point of a finger and tap of the foot. Looking past the spectacular display and they’ll see the design scheme that features a mix of luxury and industrial – a theme that continues throughout the hotel. 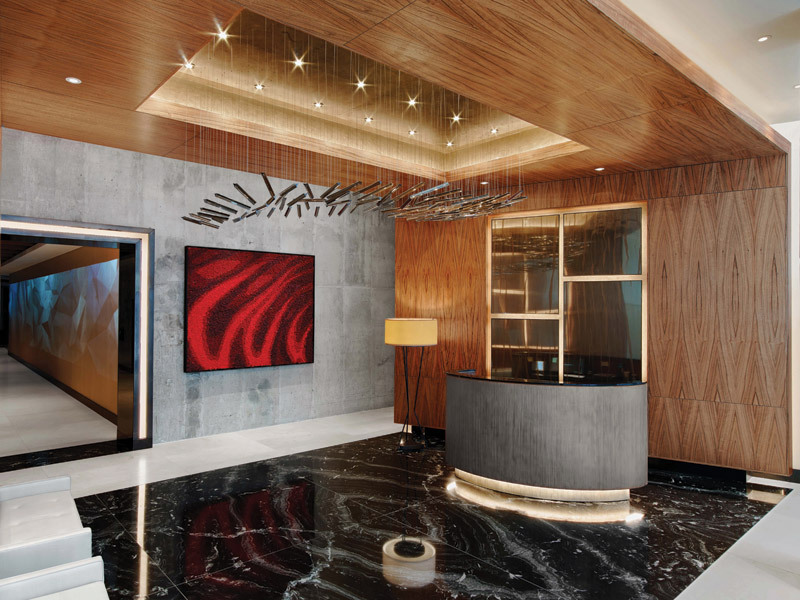 The entrance features a finely figured Paldao wood portal, inset with glass-covered fabric panels, with directional linear grains in both the wood and Eramosa marble flooring matched up to form a seamless ribbon of pattern. This rich smoothness is contrasted by the rough texture of the bare concrete wall at the far end of the space, flowing into a Kenya black marble floor. 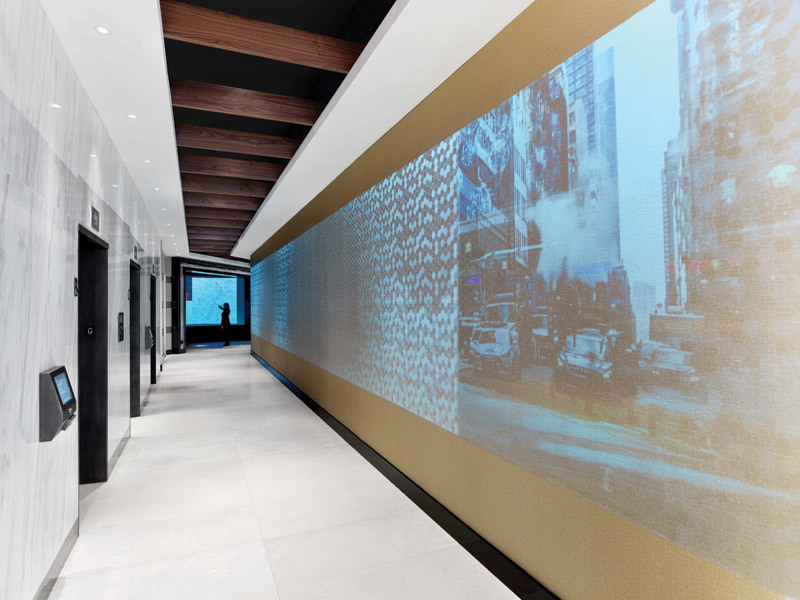 Arriving at the sixth-floor reception area, guests are greeted by a front desk flanked by vibrant photographic collages projected on to exposed concrete and depicting various New York City scenes by photographer and artist Nicolas Ruel. Blackened-metal lift doors contrast with white marble; concrete walls sit flush against figured walnut and polished Hermosa marble floors, all drawing inspiration from the grit and glamour characteristic of the city. ‘This space had to serve so many purposes – we wanted it to be a workspace, a lounge, a bar, and an event venue – so making sure it could accommodate all of those different activities,while still maintaining an open floor plan required careful consideration,’ says Jeffrey Beers, designer and founder of Jeffrey Beers International. 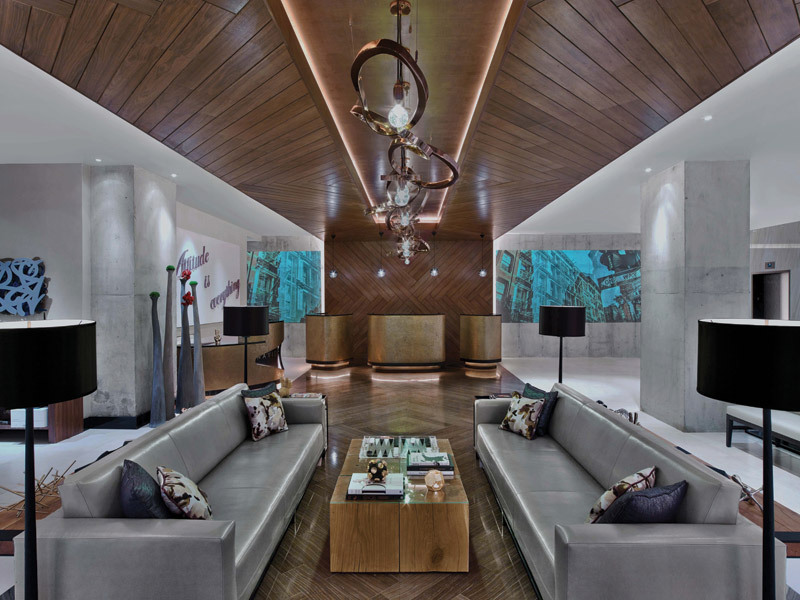 Areas are defined by millwork, including the front desk and the lobby bar opposite, which helped to overcome some of the issues faced by the design team. 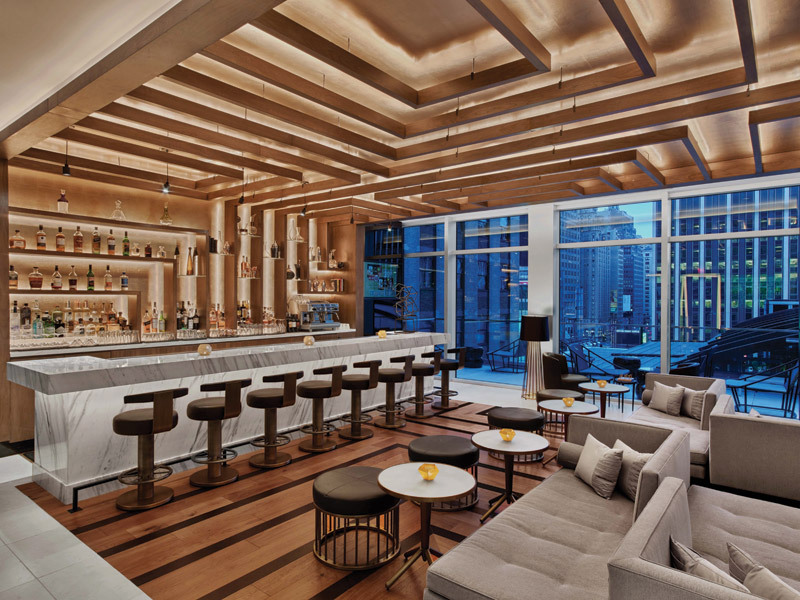 Ceiling panels are overlaid with a graphically styled walnut framework and the same bold geometric pattern is mirrored in the two-tone wood flooring in the bar. The bar itself, made of a solid slab of Calcutta marble, accommodates guests on upholstered bar stools and a small adjacent balcony offers additional seating that looks out over an expansive fifth-floor terrace. An open bookcase separates additional seating in the Library Lounge, with the divider creating a more focused, productive work environment for guests, while also not completely cutting them off from social areas. A twisting, tree-like sculpture appearing to grow through the bookcase brings in a more sinuous, organic component to offset the straight lines and right-angles of the shelving. Travelling up another floor and a long corridor, covered in an oversize map of Manhattan, leads to a flexible meeting space that can be converted into multiple, separate conference rooms. A menswear-inspired theme features subdued colours and a lightly pinstriped carpeting, inspirational quotes from the likes of Coco Chanel and Oscar de la Renta painted onto the raw concrete back wall, all nod to the area’s fashion heritage. Each of the 348 individual guest rooms has a wood vestibule at the entrance, which creates a homely feel. 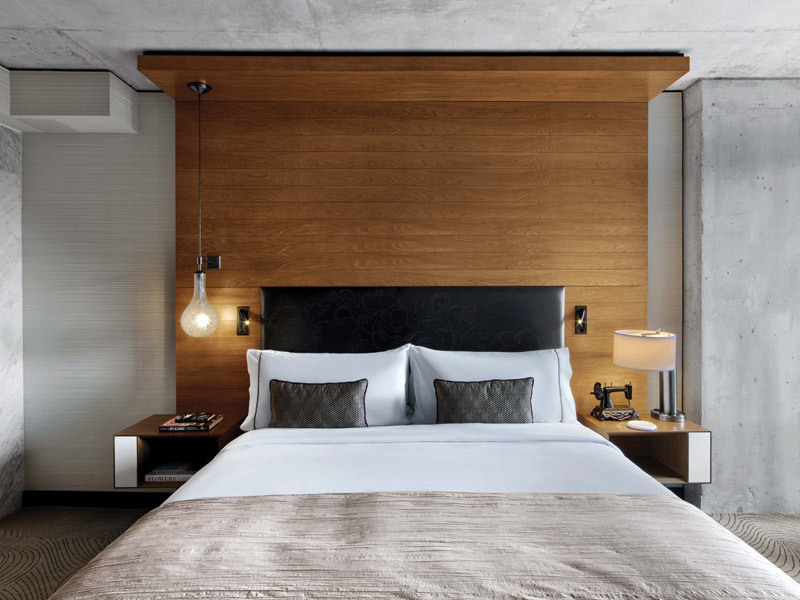 ‘For the guest rooms, the challenge was to make relatively small footprint feel airy and spacious,’ says Beers. ‘We succeeded in doing that by using pale finishes, maximising natural light with floor-to-ceiling windows, and adhering to an uncluttered aesthetic.’ A palette of neutral colours is accented with a tone of aubergine in the bedding and a touch of bright yellow in the entryway artwork. These minimalist rooms feel more spacious than their footprints would indicate.